With its lively Mediterranean culture there are various festivals and events throughout the year to truly add to your Maltese holiday experience. We’ve picked out some of the best to help you plan the best time to visit Malta! From arts, food, music, culture and sport there is something for everyone to enjoy. Nestled in the Mediterranean Sea is the delightful island of Malta. With glorious sunshine and warm temperatures year-round it is an ideal holiday destination during both the summer and winter months. Malta’s vibrant culture, wonderful beaches, countryside and baroque towns make it a fantastic place for luxury holidays. The capital of Valetta is a beautiful and charming city steeped in history, and beach-lovers will delight in the superb beaches at St Julian’s and St Paul’s Bay. Organised by the Malta Tourism Authority and Ministry of Tourism this spectacular event is free and will delight families, couples and friends. Taking place in the Grand Harbour visitors will see a whole range of magnificent fireworks and pyrotechnic displays. This exciting festival combine’s music, art, theatre and dance and is held annually in the capital Valetta. Said to be one of the top arts festivals in Europe, the fifteen day festival sees a variety of shows including Shakespearian plays, flamenco dancing and visual arts. If you’re interested in both arts and want to experience a festival with a true Mediterranean feel, then this is the perfect time to holiday in Malta. Held at Ta’Liesse, a beautiful sea front venue in Valetta this festival is set to offer all the right vibes. With many award-winning artists attending this is set to be one of the most exciting events in the jazz-scene. Alongside many performances there are master classes and workshops available for you to participate in. This delightful wine festival is now in its 12th year and this year’s looking forward to be another successful one, held in the Upper Barracca Gardens in Valetta. With a large offering of local wines, Maltese and international cuisine and live entertainment, it is the ideal event for gastronomists and oenologists alike. Held from 7PM until 11:30PM it is a wonderful way to spend an evening. The festival is also held in Nadur Gozo, on 16-18 August 2013. For those who truly wish to immerse themselves in the Maltese culture then I highly suggested attending Notte Bianca. Held in the capital it is a true celebration of the country’s people, culture and arts. Cafes and restaurants stay open late and with numerous performances in theatres, on the streets and in the piazzas, Notte Bianca will offer a truly memorable experience. This festival is also recommended for families with live entertainment galore. 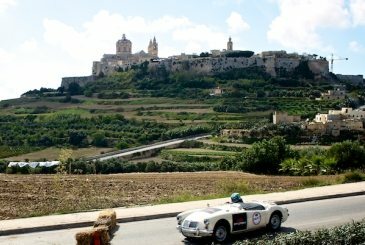 Vintage car enthusiasts will adore this event launched by the Valetta Grand Prix foundation. Taking place in Malta’s Old Capital City, competing cars have manufacturing years ranging from the 1950s to 1980s. The race takes place on the Sunday with classic car shows during the first days of the event. This prestigious race starts at the Grand Harbour in Valetta and is hosted by The Royal Malta Yacht Club and the Royal Ocean Racing Club. With almost eighty boats competing and the changeable conditions of the Mediterranean Sea, it is an exciting and inspiring race to watch. The five-star boutique Xara Palace Relais & Chateaux is located in Mdina close to the cathedral. This is the perfect hotel for those wishing to stay close to the Old Capital and enjoy the exquisite surrounding baroque architecture. Family run and designed for the most discerning travellers, this is the ideal hotel for those wishing to stay in a property which offers and air of exclusivity. Valetta is around a 20 minute car of taxi journey away. Please note that the dates of the annual events are subject to change year-on-year. For more things to do in Malta visit our post, or for more inspiration read our top 5 reasons to visit Malta.